As a species, we dream of the exotic. In the context of vehicles, outlandish performance usually comes with rare materials. And carrying on from where we were last time, let us talk about more exotic materials that go into vehicles today. But first, glass. Here's the invisible material. There is a lot of glass in today's cars, though many components have been replaced by clear plastics like polycarbonates which are less prone to breakage as well as lighter. But the big transparent surfaces remain glass. The front and rear glass now has a protective function - they're tempered (treated for strength) and laminated. Lamination sandwiches a thin sheet of plastic between two glass surfaces. This makes the glass harder to break and also causes the glass to break into less sharp pieces. Of course, glass has to be optically accurate, can offer UV protection and be tinted to cut light in the cabin. Plus you can roll the windows up and down to regulate temperature and mood. Side windows and quarter glass' is usually not laminated. The logic is that these are smaller panels, and more importantly, they are supposed to be easier to break in an emergency for egress or access. This light and strong material represents a proper threat to steel. The issue used to be that aluminium was simply too soft to use in structures. But alloying with metals like magnesium gives aluminium the required hardness. The alloys are then strong, light and durable. Aluminium started off as a lightweight replacement for steel in bodywork but now goes into everything, including engines, chassis, sub components and wheels. Its popularity comes from its strength-to-weight ratio which offers both performance and economy gains. The day someone figures out how to make aluminium at the same cost as steel, the latter will become nearly obsolete. Perhaps the most exotic of non-metallic materials today is carbon fibre. Components are made from woven carbon fibres that are baked in a resin to form shapes. The weave selected, in fact, also endows the structure with strength characteristics. The structures are very light and incredibly strong - which is the draw of carbon fibre. Carbon fibre also has the advantage of being brittle. In a crash, it breaks into small shards which consume and dissipate exceptional amounts of energy. Energy that might otherwise reach the driver and harm them. But safety isn't the primary reason for the use of carbon fibre. That remains strength and light weight. Naturally then, carbon fibre started out in specialised applications like motorsport. Now brands like BMW and Lamborghini are working towards mass producing carbon components. 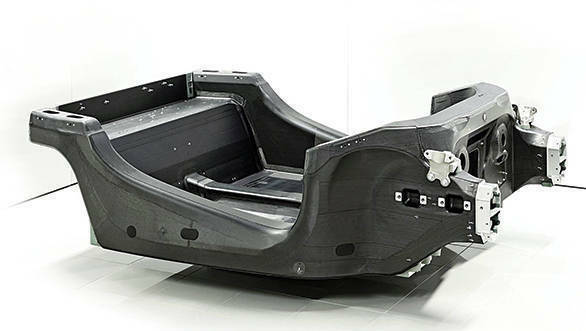 The challenge is cost - carbon fibre is extremely expensive to make. Titanium is the most exotic of metals in automotive engineering. Titanium is treasured for its strength, durability and light weight. So strong is titanium that it is hard to extract from its ore and specialised welding is required to bond pieces to each other. This is also why titanium is extremely expensive and finds use only in exotic, high-performance engines. What parts? Valves and valve springs have to survive high temperatures and high repetitive stresses - that's a good place for titanium. Gold can be used to, erm, decorate interiors but its functional use is restricted by its soft and heavy nature. Gold is usually found in the heat shielding in the engine bay of expensive automobiles - it happens to be an excellent insulator because it doesn't pick up heat well. This is the cutting edge of material tech. Nano particles are microscopic sized but they're a big leap in technology. The first widespread application appears to be self-healing surfaces. Nano particles, hardly larger than molecules and visible only on special microscopes, are part of the surface. When damage occurs, the particles can 'reset' on the application of an electrical charge. The nanoparticles can also re-orient themselves to change colours, and the combination promises  in the very distant future  a car that will always looks brand new.